In the early 1980s, Dr. Bonifacio Cabahug, Jr. and the Cabahug Clan Foundation Inc. initiated research on the genealogy and history of the Cabahug family, resulting in an extensive family tree. Building on this effort, we have searched civil and church records for information on the Cabahug family living in the 18th and 19th centuries. Below, we present a brief history of the early Cabahug family, based on these findings and historical events. We are deeply indebted Dr. Cabahug and the Cabahug Clan members their continuing efforts to expand and promote the Cabahug family. In preparing this account, we have made the critical assumption that all individuals with Cabahug ancestry belong to one, extended Cabahug family. Further details and discussion of our findings, along with family trees of early members of the Cabahug family, can be found using the links on the side of the page or throughout the text. Earliest Ancestors: Our story begins with the earliest, well established members of the of the Cabahug family. They are Jacinto Andres and his wife Maria Estefa, and Josef Silvestre and his wife Beronica Isabel. 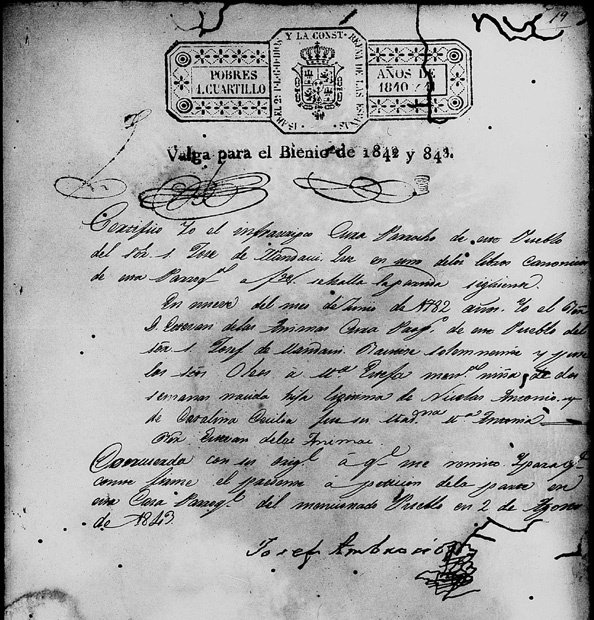 Jacinto and Estefa were named as the parents of Maria Nazarena Cabajug in her Testamento (will), which was recorded in the Spanish civil records4,24. According to the will, Jacinto and Estefa were born and lived in Mandaue. This is partially confirmed by a copy of Estefa's baptismal record48, which records her baptism at St. Joseph in Mandaue in 1782. The will of their daughter and a notary record by their son, Ambrocio Cabajug35, indicate that Jacinto and Estefa had a successful business and owned several pieces of property. Both Jacinto and Estefa died before 1850. Silvestre and Beronica were listed in the 1845 marriage record of their son, Francisco Manuel (later Francisco Cabajug)4a. According to this record they were both mestizos and born in Mandaue. Based on the status of their children, they were successful, respected residents of the "visita de Liloan", a northern settlement in Historic Mandaue. Silvestre apparently died before 1845. However, Beronica lived until 1858, having adopted the surname Pepito. These records indicate that Jacinto and Silvestre were born in Mandaue and, more important, they were longtime residents of Mandaue. Further, it is very likely that they had other brothers and/or cousins, as part of a close-knit family. It is this group that formed the generation which gave rise to the many members of the Cabahug family of Mandaue. Records indicate that they were all born in Mandaue in the late 1700s. Since their children adopted the name Cabajug, Jacinto and Silvestre were either brothers or at least first cousins, and members of a close-knit family. Chinese Ancestry: The Chinese ancestry of the Cabahug family is clearly attested in family tradition and in the church records of Liloan4a, which classify family members as mestizo Sangley, the term used for individuals of Chinese blood. From the beginning, Spanish policy required Chinese and their descendants to live in a designated area in Cebu, called the Parian17. By the early 1700s, nearly all residents of the Parian were Chinese mestizos with only a few local Chinese17,18. And, by the mid-1700s, these Chinese mestizoes played a major role in the local economy, which was beginning to grow18. (See Historical Background). Then, in 1760, Chinese mestizos began moving out of the Parian into the rural area surrounding Cebu City, particularly into Mandaue and Talamban17,18. According to Dr. Cullinane, these migrants were of modest means and, presumable, were looking for opportunities to improve their livelihood. Accordingly, it is likely that the parents of Jacinto and Silvestre migrated to Mandaue sometime between 1760 and 1780. Who these ancestors were and how many moved we do not know. We can only suggest that they were likely from a single family of modest means looking for a better life. Adding to our knowledge, Dr. Bonifacio Cabahug, Jr. has transmitted the family remembrance that the founder of the Cabahug family was a Chinaman named Yu. Unfortunately, records no longer exist which would establish when Yu lived and provide the link between him to his descendants. The First Cabajugs: As seen above, Jacinto and Silvestre did not carry the Cabajug name since, prior to 1850, most residents of the Philippines did not have a surname. This changed when Governor General Narciso Claveria issued a decree requiring all residents to adopt a surname by June of 1850. At that time, the Cabajug name came into existence and was adopted by members of a single Mandaue family; all brothers or closely related cousins. The new Cabajug family members in 1850 included Bartolome/Bartolo, Benito, Felix, Francisco, Mariano, individuals already known to the Cabahug Clan. Other newly identified family members in the records are listed in Table I and Table II. These individuals are part of the next generation of the family and the first to use the Cabajug/Cabahug name. However, our list is certainly not complete, due to the limited records which have survived. Information from the early records does give us insight into the of the Cabahug family in the last half of the 1800s. First, the notary and court records helped identify a number of family members, most of whom resided in Mandaue (see Table I). However, these records are limited, since they were primarily used by wealthy individuals to record important transactions; they tell use nothing about the less well off. The records do show that Cabahug family members were successful businessmen and indicate that they were among the leaders in society. Further, they demonstrate that Mandaue was the center of family activity. The notary and court records also give possible evidence of migration of family members. In particular, individuals are found who are residents of Tabogon (Mariano) and Cebu City(Felix), in Cebu and of Cadiz (Antonio) and Sibluan (Telesforo) in Negros. In addition, other family members were land owners in Borbon (Bartolome and Modesto), while remaining residents of Mandaue. This migration is supported by church records (see Table II), which show that the Cabahug family was well established in the northern Cebu towns of Bogo, San Remigio and Tabogon well before 1900 and indicate the ties of some family members to Mandaue. Civil Register: To further identify where members of the Cabahug family lived in the late 1800s, we used marriages recorded in the Civil Register for the period of 1921 through 1932. These registers give the birth place of the bride and groom, thus indicating where their parents lived in about 1900. Our findings are listed in Table III. The largest population of Cabahug family members is found in Historic Mandaue (Mandaue, Consolacion and Liloan). As home to the earliest known family members, this is not surprising. Significant populations of family members are also found in the towns of northern Cebu (Borbon, Tabogon, Bogo and San Remigio) while few indigenous family members are found elsewhere in Cebu. Notably none are found in Cebu City. In addition, populations of family members are found in Allen, Samar; Cadiz, Negros; Ormoc, Leyte and south central Bohol. These results are consistent with the information in Table I and Table II, while identifying new populations in Allen, Ormoc and Bohol. At this point we have only limited information on the relationship among these populations and it remains to be seen whether they are part of one Cabahug family. Cabahug Success: The founders of the Cabahug family, starting with Jacinto and Silvestre and others of their generation laid the foundation for the Cabahug Clan of Mandaue. Their children built on this foundation by strengthening the Cabahug base in Mandaue and initiating expansion of the family into the northern Cebu. By the early 1900s, the Cabahug family was a major contributor Mandaue society and the family had expanded into northern Cebu, and possibly to adjacent islands of the Visayas. These pages were last modified 6/10/2017.